As mentioned in the introduction of Chap. 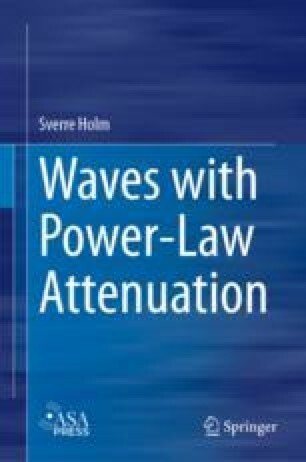 5, this chapter is concerned with wave equations that are made to fit frequency domain power laws with little consideration for time domain properties. First wave equations which are found by manipulating the common wave equations will be discussed. This is done by replacing ordinary derivatives in time or space with fractional ones. In some cases, this will give the same solutions as those found from fractional constitutive laws, and in other cases new equations will result.